I was beginning to feel like I knew what to expect from Donna Sharp. Her patchwork designs typically take their cues from Vera Bradley, with gentle colors and classic designs. While the Denise is just as classic at its core, its bold zebra stripes and contrasting black trim help it stand out from the pack. I wouldn't say that it's wild, but it's got more attitude than most of its stable sisters. 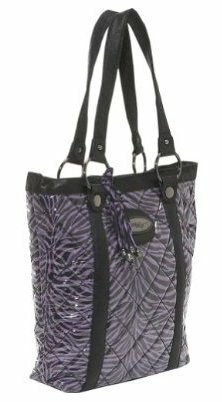 The Denise's finish might be much sharper than most Donna Sharp designs, but at its heart this is a very traditional tote. It's large but as it's made from cotton it's really light. I love the playful polka dotted purple lining, and the useful pockets that line its internal walls. I wouldn't say it exceeds our expectations, but it certainly meets them. I'm not sure what Donna Sharp's loyal fans will make of this playful tote, but I'm thrilled to see the label releasing something so fresh. I’m also glad to see her pricing policy hasn't changed. At $64 this tote is just as affordable as the rest of her range. The tan zebra Donna Sharp Denise bag, a great alternative to this purple bag.